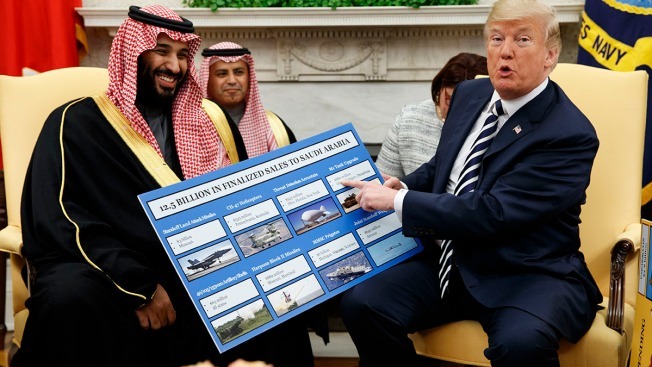 President Donald Trump shows a chart highlighting arms sales to Saudi Arabia during a meeting with Saudi Crown Prince Mohammed bin Salman in the Oval Office of the White House, March 20, 2018, in Washington. At 32 years old, Saudi Crown Prince Mohammed bin Salman controls a vast fortune, a well-heeled military and the future of a nation in the throes of sweeping economic and social change. His ambitious bid to remake Saudi Arabia received a ringing endorsement Tuesday from President Donald Trump as the future leader opened a marathon tour of the United States. Soaking in Trump's plaudits in the Oval Office, Prince Mohammed said little and left most of the talking to his host, who offered an optimistic forecast of lucrative U.S. arms sales to the kingdom and more Saudi investment in the United States. Thousands of American jobs will result, Trump said, even voicing approval for the crown prince's "tremendous" move last year to push aside his older cousin to become first-in-line to his father King Salman's throne. "Your father made a very wise decision," Trump said. Prince Mohammed is on a mission during his three-week U.S. visit to improve the perception of his nation in the eyes of Americans, who have viewed Saudi Arabia warily because of its conservative social mores, unequal treatment of women and, more recently, deadly military campaign in Yemen. Even as the crown prince joined Trump for a meeting and working lunch, Congress was discussing legislation to scale back U.S. military support for a Saudi-led coalition in Yemen, with a preliminary vote planned for Tuesday afternoon. Trump and the crown prince looked past that and other points of friction as they dined together in the Cabinet room, flanked by Vice President Mike Pence, Trump son-in-law Jared Kushner and a bevy of Cabinet secretaries. Instead, they focused on areas of easy agreement: Saudi investments in the U.S., American arm sales to the kingdom and sharp criticism of mutual foe Iran. Trump sounded an ominous note as he looked ahead to a May decision about whether to stay in the Iran nuclear deal, loathed by both Trump and the Saudis. 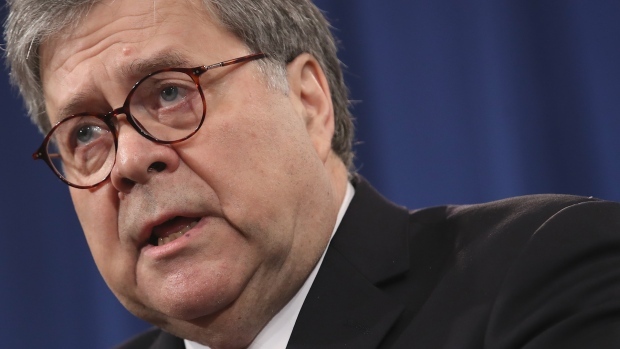 "We'll see what happens," Trump said. "Iran has not been treating that part of the world, or the world itself, appropriately. A lot of bad things are happening in Iran." Prince Mohammed dodged a shouted question on the Iran deal, but waxed optimistic about prospects for closer economic ties amid "new waves of opportunities in different areas." "The opportunities are very huge," Prince Mohammed said in English. While in Washington, the crown prince is holding separate meetings with a long roster of influential U.S. officials, including the secretaries of defense, treasury and commerce, the CIA director and congressional leaders from both parties. Kushner and White House envoy Jared Greenblatt, who are drafting Trump's long-awaited Mideast peace plan, will also join the crown prince for dinner, the Saudi Embassy in Washington said. For all his taboo-busting changes at home and risky moves in the Middle East, Prince Mohammed is still a mystery to the United States and much of the West. He has allowed women to drive and opened movie theaters shuttered since the 1980s, advocating a more moderate brand of Islam than that which has dominated Saudi life for the last four decades. But he's also asserted power in the Middle East in an altogether new way for a Saudi monarch, detaining some of his country's richest and most powerful men in a stunning anti-corruption campaign that netted over $100 billion. Critics saw it as part of an authoritarian power grab that disregarded civil law. The crown prince also has been closely identified with the three-year-old war in Yemen, the Arab world's poorest country, which started while he was defense minister. The Saudis and their allies are fighting Iran-backed Houthi rebels, but international organizations have harshly criticized the coalition's airstrikes and blockading of Yemeni ports for contributing to thousands of civilian deaths and a humanitarian catastrophe. Images of the humanitarian catastrophe in Yemen prompted Trump last year to issue a rare rebuke of Saudi policy, urging the kingdom to lift a blockade on the civil war-wracked country "immediately." Still, Trump's administration doesn't want Congress to cut assistance for Saudi-led operations there, warning that without U.S. help, civilian deaths would only increase. The Saudis are working aggressively to change perceptions. They've cast themselves as essential partners against Islamist extremist groups and, especially since Trump's maiden overseas voyage last year, touted their lavish purchases of high-tech goods from job-creating American companies. In Yemen, the kingdom says it is improving military targeting, opening up ports and pledging $1.5 billion in new aid. Associated Press writers Lisa Mascaro, Jonathan Lemire and Jill Colvin contributed to this report.